Hyperloop Transportation Technologies (HTT), the company leading the charge to realise the concept of transporting people and cargo safely, efficiently and very quickly through vacuum tubes, is set to bring its own brand of disruptive thinking to Nor-Shipping 2017. The firm, which encompasses more than 50 teams working together across 38 countries, is sending a delegation led by Co-founder and Chairman Bibop Gresta, who will speak at the maritime event week’s Opening Conference on 30 May. HTT will also exhibit in Nor-Shipping’s new Disruptive Sustainability hall (Hall A) in Lillestrøm and host the International Networking event in the Delegates’ Lounge on the opening evening. Focus areas for HTT will include port efficiency and hinterland connectivity. “This is a real coup for us, and our delegates,” comments Nor-Shipping Director Birgit Liodden. 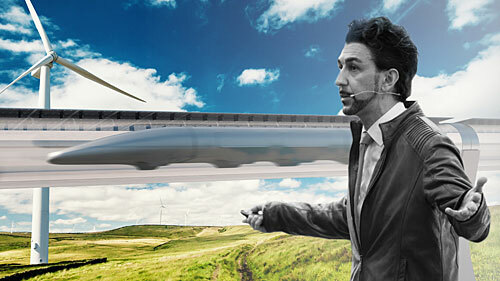 “The hyperloop concept was introduced to the world by Elon Musk, and HTT, which uses incredibly fast, safe and environmentally friendly ‘passive magnetic levitation’ technology, has emerged at the vanguard of the race to realise its potential. “The system, which can transport suspended capsules containing either passengers or cargo at speeds of over 1000 km/h over long distances, is a true disruptor. It can revolutionise the way we travel, and the fundamental nature of our industry. For example, ports could use hyperloop to transport containers to and from inland depots, drastically reducing congestion, surface traffic, emissions and handling time. “HTT has signed a series of agreements with partners such as the city of Brno, Czech Republic and Abu Dhabi, UAE to test feasibility and development potential,” she states. “This technology, which is supported by an innovative global crowdsourcing network, is here to stay and we believe it can genuinely impact upon and inspire our industry. HTT joins a range of high profile exhibitors that have already booked their place in the 1245 sq. m hall, including DNV GL, DNB and Siemens. Gresta, meanwhile, is another star name on a speaker programme that already includes global thought leaders Tony Seba and Parag Khanna, Leif O. Høegh, Chairman of Höegh Autoliners, Mike Utsler, COO Woodside Energy, Peter Justesen, Chief Shipping Officer at Engie, Norbert Kouwenhoven, IBM Global Trade Digitisation, Customs and Borders Lead, and Peggy Liu, Chairperson of Joint US-CHINA Collaboration on Clean Energy (JUCCCE), amongst others.